Not much I can say about this. Mom did it. Tagged blog hop, cat, cat photos, funny cat photos, Wordless Wednesday. Bookmark the permalink. Looks like this kitty is ready for Halloween. Great shot!! Lol. MOL! You’ve got some crazy fangs there! Aaaaw How cute yous look. Hav a gweat day. 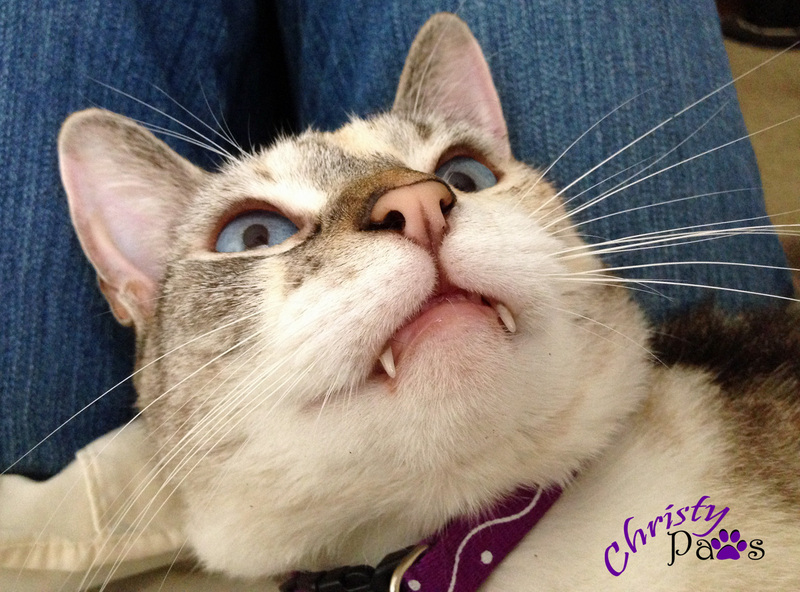 “FANGZ” fer da cute piccie Christy kitteh…me haz NO teefiez so me iz admirin yerz!! Dey are lubly! Thanks! We have two kitties in our house with no teeth. It doesn’t effect them in the least and I’m sure it doesn’t you either. What wonderful whiskers you have but your expression is quite scary – have you seen a ghost! No ghost, just my mom. MOL! What a great picture. Great big eyes and those wonderful fangs showing. Happy Wednesday to all of you. that is HILARIOUS, ADORABLE AND PURRFECT!! !